You may be surprised to find this unusual looking tool among planes, as it does not at all resemble one. Because it looks like a sculpturing tool, you may even suspect that it might have been mistakenly included with the planes. 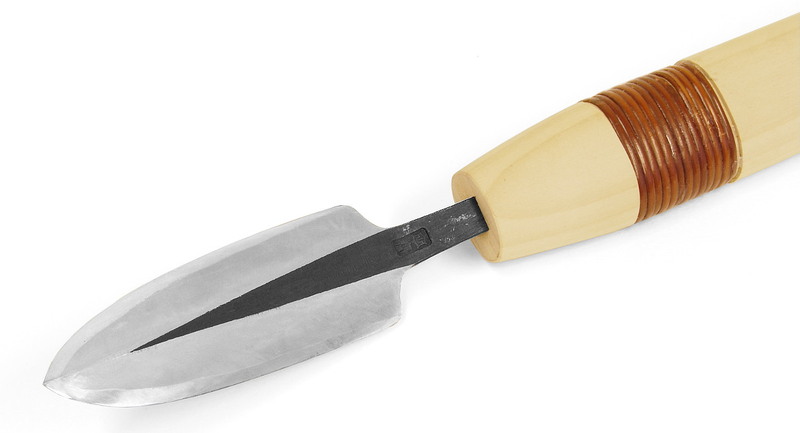 But in fact, it is a plane in its earliest form, and used in Japan since about 1000 A.D. You'd be amazed at the fine shavings that this tool can produce, in experienced hands and properly sharpened! This is not simply a museum piece and of no practical use today. Many woodworkers have discovered the Yarri Kanna and consider it indispensable! The furniture restorer can reduce inlays to the proper thickness without damaging adjacent surfaces. The sculptor can smooth the surfaces of his work without roughening the grain with sandpaper. This tool opens a wealth of possibilities for surface treatments for the artist and the designer, by filling the gap between the scrub plane and smoothing plane. Take a look at the instruction page of the Yarri Kanna. Old iron used for Jigane, which is the softer layer is called "Watetsu". "Watetsu" often shows cracks in the surface which can be seen in the enlargement.